Welcome to New Beginnings Church in Orlando, Florida! We run a 9:00am and 11:00 am on Sundays and, before a single fader is touched, button pushed, or switch flipped, it is imperative to seek God in prayer, and ask Him to create His sound, His lighting, His video, and His worship! We must saturate everything in prayer, especially the technical! Everything we do, especially in a house of worship, is geared towards connecting people with Christ. This is why almost all audiovisual enhancements must be metaphorically invisible. 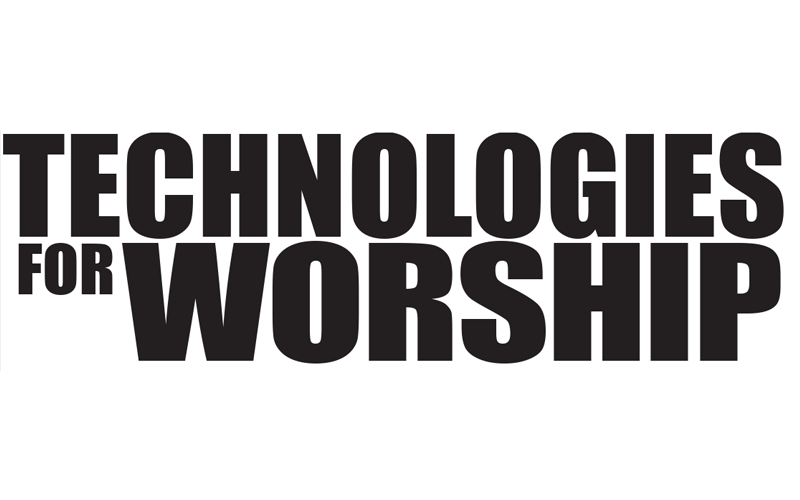 Ultimately the AV equipment is there as a means to further enhance the worship experience, not to be worshiped for what it does. I am always looking for “low profile” gear that has a flat learning curve. Therefore, everyone on “the team” will feel comfortable operating the gear on their own, while maintaining the same standard of excellence. 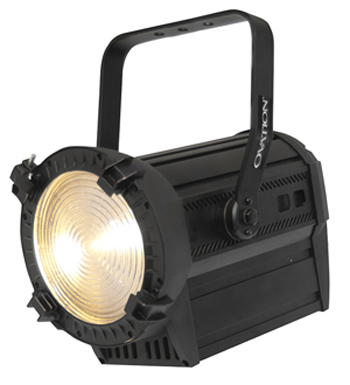 The Ovation FD 165 warm white Fresnel light by Chauvet Professional falls into that category of flat learning curve gear. The Ovation FD-165ww features easy access dimming and zooming control, which can be accessed simply by double clicking on the respective knob. Having both 3 pin and 5 pin DMX input and output means flexibility! When plugging into a power source, there is an Edison (standard three prong wall plug) to Neutrik PowerCON connection (the blue and black round plug), and an output from the fixture with the same PowerCON connector, that works on a standard dimmer or via DMX. The Ovation FD-165ww accepts all 7.5” accessories for fresnel fixtures. Based upon specs posted by Chauvet Professional, at full 100 in the dim menu, the color temperature for this lamp ranges between 3150 K and 3184 K. The DMX controllable zoom starts at a 13 degree spot, and goes to a 54 degree flood, with field angles at 25 degrees and going to 76 degrees. The 16 bit dimming curve, while paired with the respective dim and zoom to match a tungsten fresnel, is unnoticeable to the untrained eye. Right out the box, the Ovation comes with a three foot Edison to PowerCON cable, and a gel frame, which is quite delicate. Barn doors are not included; this is a $50 accessory you will have to purchase on your own, should you desire. The Ovation FD165ww fresnel is priced at $1239.99 MAP, which seems high until you compare it with other LED fresnel fixtures, which are closer to $2000 per fixture. Here is what I learned while setting up the Ovation for a side-by-side comparison with the current install at New Beginnings. 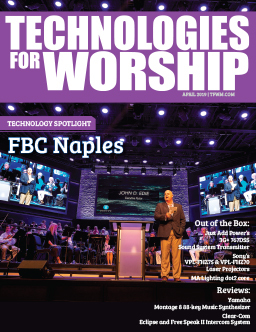 The fresnels lamps at NB Church are using 500 watt tungsten lamps, and at full-on they appear dimmer than the Chauvet Professional Ovation. However, with both lights on at full, the color temperature difference is so minimal, it was nothing to fuss over. To get the Ovation to blend with the tungsten fresnels, I had to dim the LED fixture to 66, and adjust the zoom to 47 (both on a scale from 0 to 100). After blending these lights together, it was time for a power cycle! The Ovation takes a few seconds to fully power back on, but once it does, you will find it with the exact same settings that were dialed in before its power was turned off. I also like the fact that I could plug the Ovation into a DMX controller directly and control the lights or just run it off my dimmers. Easter Sunday was the debut for the Ovation, along with a complete overhaul of the lighting set up at New Beginnings. The theme I wanted to create was that of a sunrise/sunset. I didn’t really need the Ovation as a front light, and I only had one fixture to use. So thinking of the best way to make its presence known, I decided to up light the cross, which is directly behind the drummer. Using the yoke of the fresnel, I propped it up roughly 3 feet away from the bottom of the cross with the zoom at 38 and the dim at 80, to create the appropriate wash. In order to achieve the multi color sunrise with only one fixture I had to get creative. Do you remember kaleidoscopes? This came to mind as one R22 gel just did not give the look that was needed. So after strategically cutting and layering some scrap red (R821 & R22), yellow, and orange gels (other official colors unknown), I was able to achieve a multi color sunrise look on the cross. Traditionally my specialty is audio, but over the past couple years of working in corporate AV, I have acquired knowledge in several other disciplines. Going in to this project, my lighting knowledge extended to your basic untreated source 4 par, podium and stage wash, along with addressing the occasional LED color charges. I didn’t have any experience with CTB, or CTO, let alone any lighting design. However, after much research and consulting with two colleagues of mine, I finally grasped the concept. Lighting is very much like audio, in the sense that the goal of your “mix” is balance, and clarity. Too much 3 khz in your audio, and the experience for the listener becomes uncomfortable. Too many warm colors, your stage may lack depth, and nothing will command the attention of the viewer. 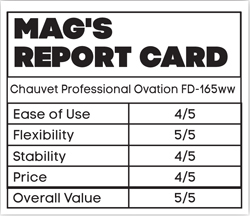 With all that said, if the Chauvet Professional Ovation Fresnel is easy enough for this audio guy to use effectively, it should be a breeze for anyone else with the slightest technical inclination. Josh “Mag” Tynes is an AV Specialist that offers technical operation, and consulting for houses of worship. 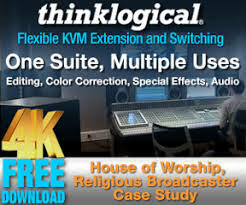 He also offers ministry focused live sound training with Worship Leaders Association Inc.